Hong Kong’s pro-democracy protesters are set to hold a street poll on Sunday on the next steps for a mass movement that has paralysed parts of the semi-autonomous Chinese city. The vote, which will take place at the three protest camps that have sprung up across the financial hub, will ask demonstrators how to respond to conciliatory measures offered by the government in a bid to end the sit-ins that have blocked major junctions for nearly a month. Tens of thousands of Hong Kongers spilled onto the streets in late September in anger at Beijing’s refusal to grant free leadership elections to the former British colony, insisting that candidates for the 2017 vote must be vetted by a loyalist committee. But the crowds have dwindled, with protest leaders struggling to keep up momentum and clashes breaking out with both opponents and the police. In the latest ugly scenes, four journalists were attacked by angry pro-government demonstrators on Saturday evening at a counter-rally calling for the democracy protesters to go home. The office of Hong Kong leader Leung Chun-ying said that officials “strongly condemn this savage act” and that police were investigating the incident. Pro-democracy group Occupy Central, which has been at the vanguard of the mass movement, has insisted that withdrawal is not an option and that Sunday’s vote is not about whether or not to stay on the streets. The vote, which will take place by mobile phone on Sunday and Monday evenings, will allow protesters to “express their views”, as well as to “put pressure on the government”, the group said. 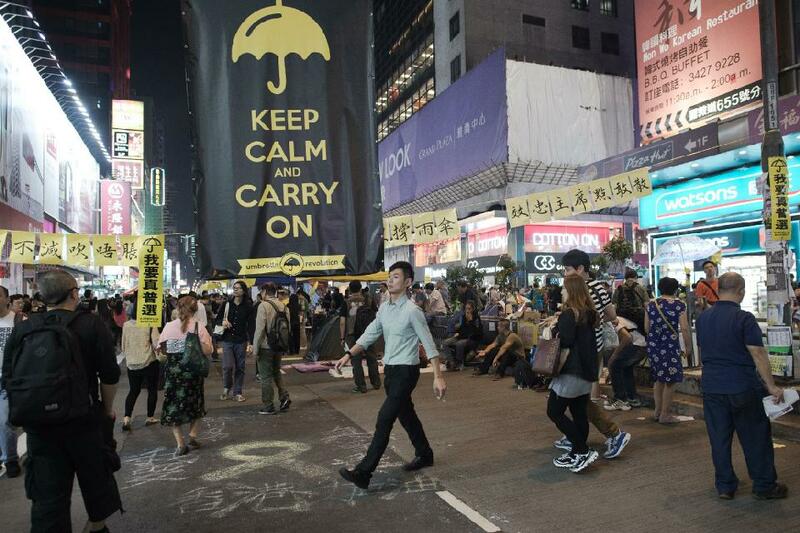 The street poll comes after Hong Kong’s government made tentative concessions to the protesters during talks this week, saying they would file a report to Beijing on recent events and suggesting that both sides set up a committee to discuss further political reform beyond 2017. Voters will be asked two questions about how to respond to the government offers. The first asks whether the government report to Beijing must include a suggestion that authorities reverse their decision to vet candidates for the 2017 leadership election. The second asks whether further talks with the government through the new committee must proceed on the basis that the public should be able to choose their own candidates in 2017. The pro-democracy movement is facing growing pressure to decide on its next move, with frustration growing among residents after a month of traffic mayhem caused by the protests. Several thousand people attended Saturday’s counter-rally demanding an end to the demonstrations, with one opposing group saying it had gathered 320,000 signatures from people calling for the protesters to go home.